She may be dead seeing this thread was started 6 years ago! Has this site been abandoned by the staff here, SHeesH! Most forums on this site have not been updated in 5 years! This is not good, please mods go and just update the front major thread page posts in each section so at least they LOOKS like they have been posted in the last few weeks NOT years!!! these are the steps that have worked for me - your mileage may vary a tad. or the smiley face icon and hit accept. 3. - right click 'trusted root certificates' in the left pane, and choose import. 5. - you should get a popup from windows asking if the cert is indeed to be added to the store - choose yes. ...now, if you load up Eudora, it should all just work like new. My Windows version is W7 Professional, SP1. My original QCSSL.dll file was "last modified" on 10/4/2006, if that matters. 3. Download my QCSSL-Edited.dll file, to anywhere you can find it. 4. Rename it to QCSSL.dll and move or copy it to that Eudora program folder (with Admin privileges again). You can't do it in a slightly simpler way, and this way is reversibleto your original version. I had looked for some time online and I did come across a few good tips for the problem. One was to open the AVG program then go to tools > advanced setting. 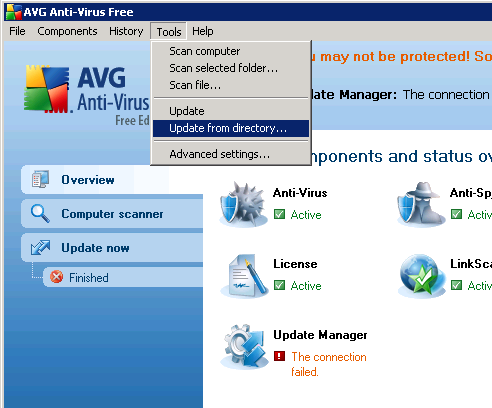 In the lower left column under Updates click on manage ...it will open the Update management. First try clicking on delete temporary update files, then click yes and try to update again. If that did not work try to do the same process, but click on Revert virus database to previous version. Then do the updates again and you will see after a while that a new and updated database has been installed. Page loaded in 0.179 seconds with 21 queries.